No matter how old your kids are it's never too late to have them start understanding the value of money and to expand their money. Can you name any kid that doesn't want or know what money is? How many just ask for money and not understand where it comes from or why they can’t have $20+ for just anything he or she wants? 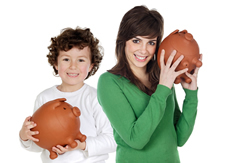 Children and teenagers need to understand how money is earned, how to manage money and how to save. Kids and teenagers relate to things that are important to them or that they think is fun and cool. Think of ways to make talking about money and the importance of it fun that relates to something they like to do. For example, if your son loves video games or your daughter wants to go shopping, explain that they must earn money through an allowance and have them come up with the chores and sign off on it. Once they have their money, explain how they should save part of it and spend some of it. Or if they want to spend it all, explain how he or she won’t have the money they need to buy the latest thing that comes out but if they save or wait for a discount, they can buy more with their money. If he or she is into TV or video games, create or find things that use one of their favorite shows or games. Introduce things that are exactly like the things they like. What is money and why is it important? What are taxes and why must we pay them? Reward- If you get good grades say "A"s, do you get money for your efforts. What happens if you get all "A"s. Some kids get $100 for all A's work something out with your kids or encourage them to negotiate with you. Understand in order to gain something that must give something up. Tell them the importance of staying in school in order to get a great and rewarding job to pay for their bills, save money, grow and invest their money and to have fun. If your son is into video games, then encourage him to go to school and learn how to become a game programmer. Also inform him that the games he plays now are from people who went to school and did something they loved. If your daughter loves clothes, encourage her to become a fashion designer or buyer. She can go to school and learn to apply what she loves and most of all, have an impact on what kids will be wearing when she gets older. Kids love to know that they will make a difference.